I received a special care package the other day from some super awesome people in Vankleek Hill - A bottle of Beau's Cavalier Bleu Blueberry IPA and a bottle of Halcyon Barrel House Shifting Sands: Peach. You can already tell I'm giddy. Jack at Eclectic Beverages has been raving about Cavalier Bleu for well over a month now, he can't stop talking about it! Cavalier Bleu was part of Beau's annual FeBREWary collection where the brewery brings out a new beer each week of February to help beer drinkers overcome the depressing, gloomy month. Cavalier Bleu is a Blueberry IPA brewed with with an organic medley of hops (Rakau, Azacca, Nelson Sauvin, and Mandarina Bavaria) and organic blueberry juice from wild Quebec blueberries. I don't recall if I've ever had a Blueberry IPA, I've certainly had IPAs with just about every other fruit that I can think of.. but certainly not blueberries. I'm not sure how it will turn out.. so let's see! Appearance: While I was expecting (for some reason) to see this look more like a typical golden IPA, it actually looks like your typical blueberry ale.. which shouldn't be a surprise. The beer has a dark ruby red appearance with a light amount of carbonation and a decent sized off-white head that quickly diminishes to just a half a finger's worth once I started writing this. Aroma: Fruity and malty forward beer with notes of blueberry juice, a bit of a caramel malt, a hint of pepper spice from the hops, a somewhat bitter yet grassy hop presence, as well as a light tropical and fruity hop presence that's reminiscent to hops like Galaxy, but mostly toned down to let the blueberries shine in this beer. Taste: The beer is somewhat sweet fruity and had a hint of tartiness to it. There's notes of toasted barley to give it a light amount of grittiness to it, the taste of blueberry/grape skin (you know that taste), and a light amount of hop presence. The hop presence is giving off mostly a light bitter pine flavour that I'm only really getting at the very end of each sip.. as well as leaving behind a mild bitter aftertaste at the very end. Pretty dry for an IPA. Overall Thoughts: This is an interesting combination but I feel that the beer was more of a blueberry fruit beer rather than a blueberry IPA. The sweet yet tart notes over-dominated the hops in every sniff-n-sip I took. The hops were definitely present but nowhere near as much as I was hoping, I was kind of hoping for some of the great Full Time IPA hop notes would be sneaking their way into this beer, but unfortunately they don't. 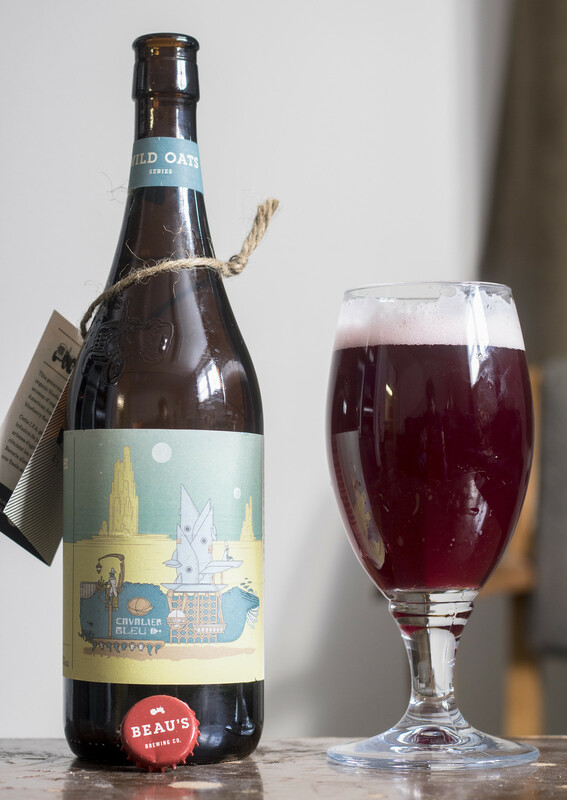 The thing with blueberry ales is that most of them either taste too extracty or too sweet. This one was neither, it was a nice sweet yet tart beer that definitely works more for this season than spring or summer.